Spencer Yachts Of Richmond BC. History of engine maintance and repairs are on file on board. In 2009, this boat was partially re-rigged with a new main mast and Schaefer in-boom furlers for the mainsail and mizzen. A two-speed Harken electric winch for the mainsail halyard was installed. All sail controls may be handled from the cockpit. Steps to the top of the main mast. Steps to the spreaders on the mizzen. Seldon carbon fiber whisker pole. Harken 46ST 2 speed electric winch on cabin top. Barient 27ST mizzen sheet/halyard winches. 12 volt, 9 batteries charged by: engine, solar panels, shore power, generator 2000 watt portable gas generator new 7-2017. Marinized with custom carrying bag plus running box on the deck behind the dinghy. There are two fiberglass fuel tanks, 1 @ 50 gal. and 1 @ 150 gal. There are three water tanks of 100 gal. each. Two are fiberglass and one is polyethyene. There are two plumbed waste water systems aboard. One is a 12 volt treat and discharge system and the other is a manual pump to a holding tank with either a manual pump out or a Y valve for overboard. Capacities and dimensions are not verified by Waterline Boats / Boatshed, and are reported from seller's information and/or literature. Starting forward is the spacious forward cabin which features sleeping for two with sail storage under the bunks. There is plenty of light natural light and ventilation. Also has an access to the chain locker forward. Just aft to port is the head with manual toilet, Corian countertop and sink with storage below. To starboard is a very large hanging locker. Continuing aft into the pilot house on the port side is a large dinette with storage under. To starboard is the helm station with outstanding visibility from the large windows. Aft to port is the access to the engine room and work bench. Also this area aft of the dinette has chart storage, a file drawer and access to the 120 volt panel. To starboard is the navigation station with the electronic control panels and a swivel seat at the chart table. Aft and down three steps on the starboard side is the spacious, well-equipped galley. Corian countertop on the starboard side with sink, stove, refrigerator, with storage above and below the counter. Opposite to this is galley storage and built-in microwave. Galley equipment: GE Microwave, Corian countertops, pressure water faucet, hot water heater , Force 10 three-burner propane stove/oven, Trident propane solenoid, (2) 20 lb aluminum propane tanks in deck box, (2) blowers in galley, front loading refrigeration compartment. Aft is the entrance to the enormous master suite. featuring a queen walk-around double bed. Starboard side storage chest and settee. On the port is the head with shower enclosure. The forward head has a manual flush and the aft head is a 12 volt electric flush. 300' Stern line on a spool in the aft locker. Full spool with Para Tech Sea Anchor. Double stainless steel bow rollers. The radar with chart plotter has AIS. 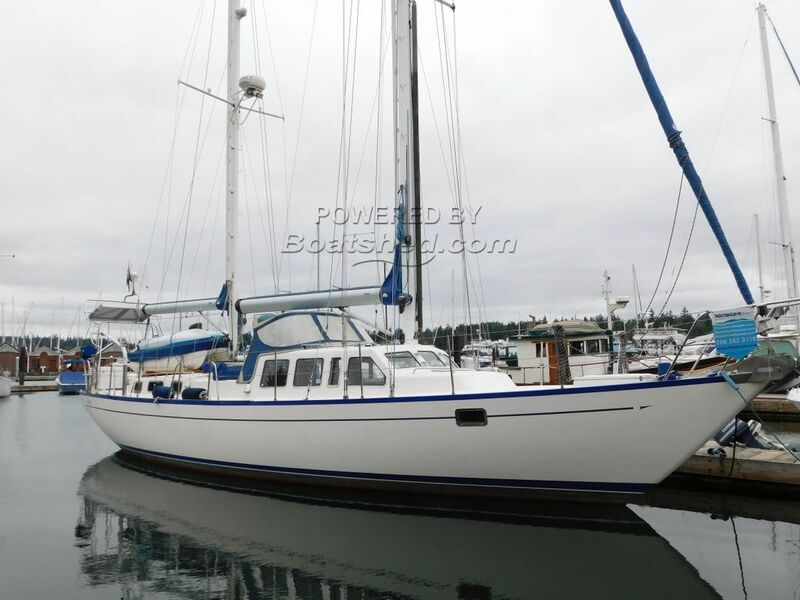 This Spencer 53 was custom-built for a Boeing engineer who knew what he wanted in a long range cruiser. She was designed to be operated under power from an inside protected helm station, and to sail well from a traditional center cockpit. Though built in 1978 she has been continually upgraded in its sails, spars, mechanical and electrical systems as well as new port lights and an Awlgrip paint job of the hull and deck, just to mention the most obvious. Now currently ready for offshore travel. This Spencer 53 Pilothouse Ketch Motor Sailer has been personally photographed and viewed by Dave Carleson of Boatshed Seattle. Click here for contact details.